My special guest today has worked every day for over thirty years to teach people about personal finance. He’s widely regarded as one of the nation’s top Financial Advisors having been named in 2016 among the country’s top ten Wealth Advisors by Forbes magazine. Barron’s selected him as the nation’s number one independent financial adviser three times and one of the 10 most influential figures in the investment advisory field today. 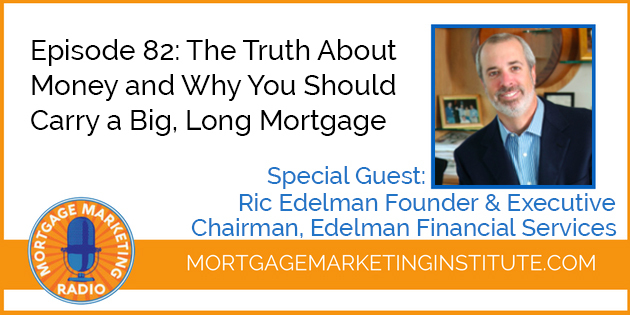 I’m talking about Ric Edelman the Founder and Executive Chairman of Edelman Financial. Ric is the Author of nine books on personal life on personal finance including his #1 New York Times best selling book The Truth About Money. Today Edelman Financial employs 161 Financial Advisers serving more than 36,000 families in 43 offices across the country, managing over $21 Billion in assets.